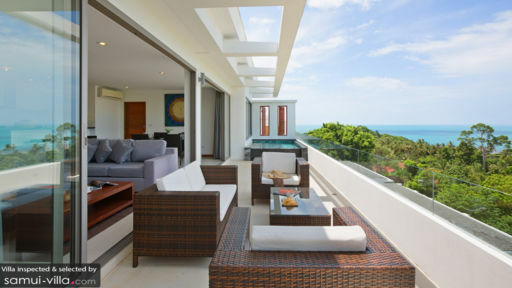 With a stunning view of the sea from its edge, Tranquil Residence is a two-bedroom holiday villa located on the hills of Lamai, close to Lamai beach in Koh Samui. The famous Chaweng beach is also not far from the villa, so you can experience its vibrant nightlife with ease. The contemporary interiors and the naturally abundant exteriors are the perfect combination to ensure your holiday is one of the best. Enjoy a fun-packed and tranquil holiday with friends and family in this personal oasis removed from the bustle of everyday life. 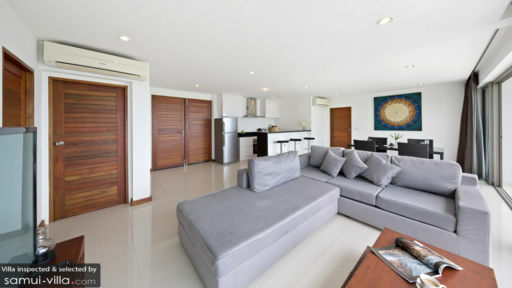 Flanking the living area are the two, well-furnished and air-conditioned bedrooms at Tranquil Residence 3. Both the bedrooms are furnished with double beds, and feature a private balcony from which you can see a remarkable view of the neighboring areas. The rooms are furnished with simple and elegant designs to create a comfortable and homely ambiance for the guests. Each bedroom has an en-suite bathroom with dual basins, walk-in showers and large windows to let the sunlight in. A terrace overlooking the sparkling sea has been furnished with rattan sofas and chairs to make for a nice, little spot where guests can rest, enjoy the view, have a cup of tea, and simply take in the gorgeous surroundings. There is a plunge pool towards the corner offering an infinity-edge style setup so you can lounge in the water and appreciate the island. There is even an alfresco dining area where you could dig into your breakfast all the while relishing the panoramic beauty of Lamai. The living area at Tranquil Residence 3 connects to the terrace through sliding glass doors that may be left open if you wish to enjoy the view. There are comfortable sofas and armchairs in the living room, so guests have a place to relax, stretch their legs, or even indulge in an afternoon nap for a relaxing day. The sofas sit facing the scenic beauty of the island so as you enjoy spending quality time with your loved ones, the view is forever in your sight. The minimally decorated living room is a calming and soothing area that features selective artwork and maximizes on comfort with its furniture. Towards one corner, you will find the dining area with a four-seater dining table set against the sea-view at the residence. Once the sun sets, the entire space is awash in a glorious light which is sure to put your mind and soul to rest as you will feel all your worries leave you. The western-style kitchen is fully-equipped to serve all your culinary needs, and is fitted with necessary amenities. The living area is air-conditioned in case you wish to enjoy a cooler ambiance as you lounge and watch some television on the flat-screen TV. The villa is fully-staffed for your convenience with a guest manager who is well-versed in four languages (German, French, Chinese, and English), a weekly maid, and housekeeping service. There is security at the villa to keep you safe and left without any worries. 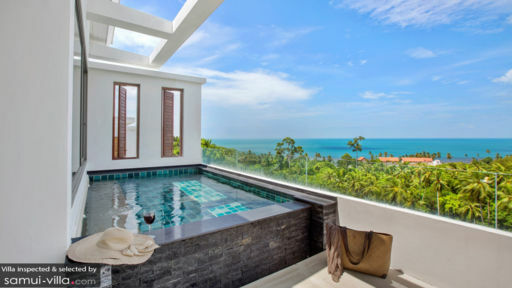 The villa is only five minutes from Lamai beach and 15-minutes away from Chaweng beach which is home to some of the best restaurants and clubs in Samui. The popular Grandmother and Grandfather rocks are located nearby to spend your day in a fun manner exploring the famous spots around Samui.